I have been lucky enough to see Wicked, the play, twice since it debuted here in San Francisco earlier this year. So of course, being me, I needed to read the source material to find out how they matched up. 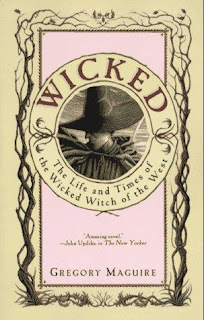 After finishing Wicked, the Novel, the first thing that is apparent is that the book influenced the play, and I could see where certain plot points came from, but beyond that...they weren't much alike. I think had I not seen the play, I may like the book more. It took me a while to get into it, but once I did, I really wanted to find out what happened next. It was very dark, very twisted, but also really hard to follow at times. I feel like certain plot points -- specifically, the impending extinction of the Animals -- were very, very underdeveloped (and this, surprisingly, was something a little more developed in the play). The connection between the Witch and the Wizard was also a little ambiguous. And, really...I did not like the Wizard, and had a hard time reconciling him with my image from the Wizard of Oz movie. And, also from what I remember from the original book, which I did read a long time ago (along with Return to Oz, which was super creepy). I feel like in this book, Maguire wanted to satisfy his own agenda, rather than truly develop further what we know of the existing characters. Overall, I am really conflicted about this book. Considering Wicked, the play, has become one of my favorites, it is hard for me to stomach some the plot points in this book. It was also really tough for me not to bust out in song every time the Wizard was mentioned ("when I meeettt the Wiiizzaardd..."). And I feel like Maguire could have made more sense of some of the issues he was trying to exploit. That said...I think had I read it before seeing the play, I may have enjoyed it more. I could have enjoyed the dark twistyness a little more.